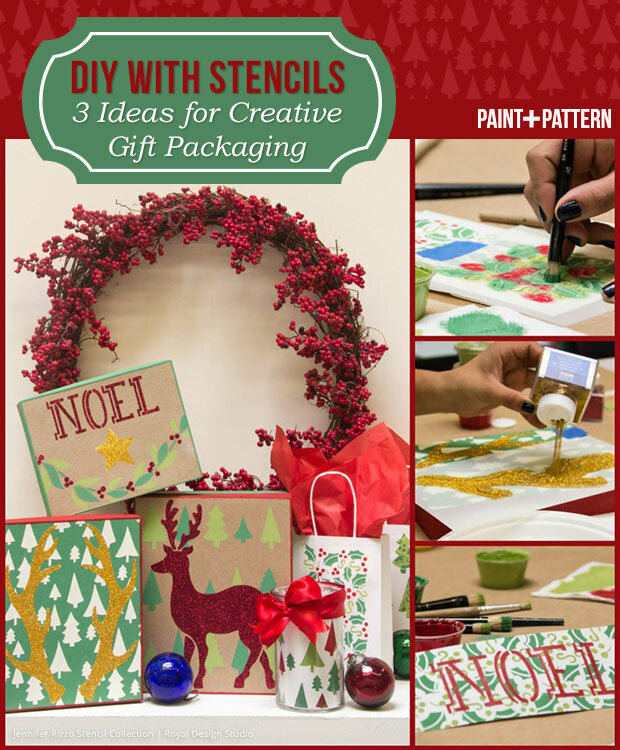 Home / Holidays / Christmas DIY Projects / Stencil DIY: Three Ideas for Reusable & Creative Gift Packaging! Stencil DIY: Three Ideas for Reusable & Creative Gift Packaging! Gifts made from recycled materials are perfect for your eco-conscious friends & relatives! But did you know that you can take it one step further and also give your gifts in eco-friendly gift packaging! This stencil tutorial has three great ideas on how you can dress up your resuable gift packaging in creative ways. What’s even better is that these stencils are also reusable! Simply change the color and the surface and your craft stencils will give you endless designs for any DIY home décor project too! Read on to see how you can do this! 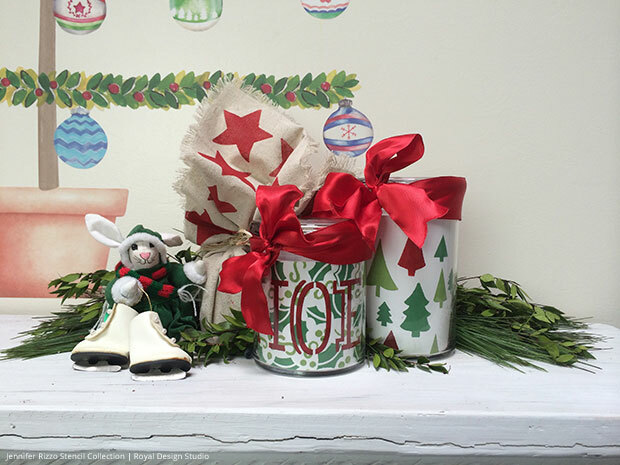 Mason jars make the cutest gift packaging for homemade Christmas Bark or a handmade scarf! Not sure what to do? Pinterest has a million creative Mason jar gift ideas! Of course, the Mason jar itself is a gift. And who doesn’t need another good solid jar. They are perfect for leftovers, beverages or holiday candy! To dress up your jar, simply stencil construction paper that has been trimmed to fit the jar. Yes, it’s that easy! Tie a satin ribbon around for an extra festive touch. If you’d like to actually stencil the jar itself – here is a tutorial on creating an etched glass design on a jar. That tutorial used these stars, however, a Monogram pattern would be great for a gift! Annie Sloan Chalk Paint: Emperor’s Silk (red), 1 part Arles + 1 part Cream + ½ part Antibes Green (light green) and 1 part Antibes Green + ¼ part Greek Blue (dark green). 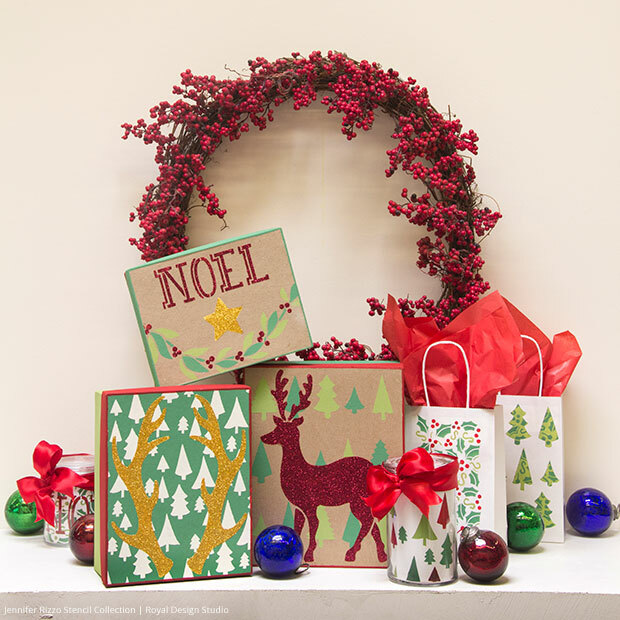 An eco-conscious alternative to wrapping paper is a decorative gift box that can be repurposed! After the gift is removed, store delicate Christmas decorations inside or display on a mantel as a decoration itself! 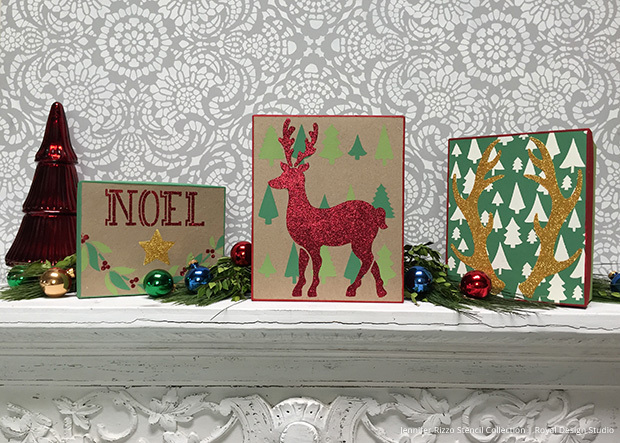 Using Jennifer Rizzo’s Mix and Match Christmas Stencils, we layered stencil designs on top of each other to give each box a unique one of a kind design. This is a great project you can do with your kids! They can let their imaginations run wild mixing stencil combinations! Just make sure that each layer is thoroughly dry before you layer the next design! Stencil Gift bags are easy to personalize and also a great activity for you and your kids! This idea is also the most cost effective, especially if you need to do a bunch of small gifts for a soccer team, your colleagues, or a classroom! 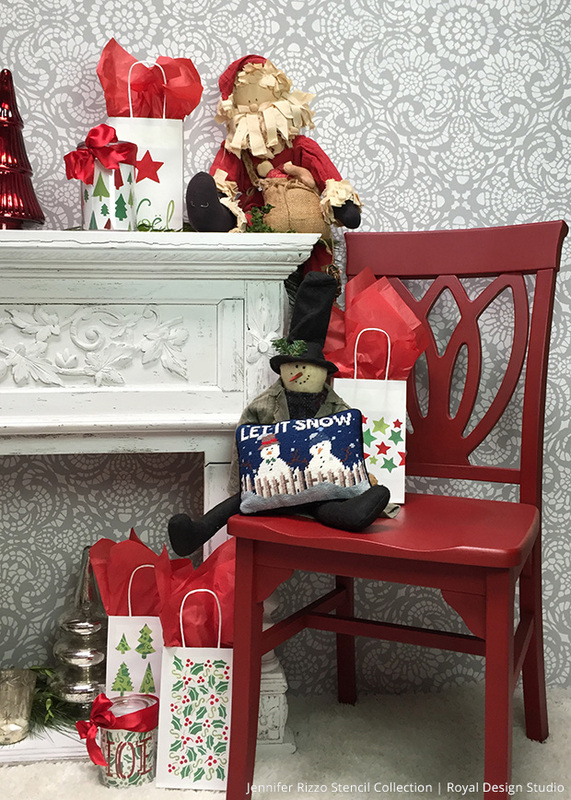 Buy a bulk package of solid gift bags and then mix and match Jennifer Rizzo Christmas stencils with various Red and Green Chalk Paint blends and you’re done! There are enough combinations that each bag can have an individual look! 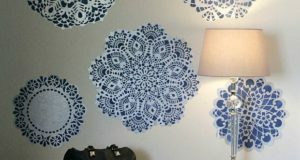 What’s great is that you can reuse your stencils on another project and spread the festive flare allover your house too! 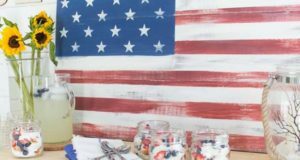 Here are some other tutorials to get your creative ideas flowing: How to stencil a throw pillow or hand towels for a guest bathroom. 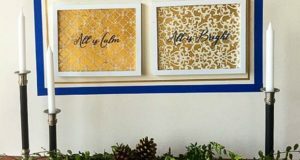 We love the holidays here and these stencils have been colorized for Christmas – which is so much fun, but if you use your imagination you’ll see that stencils are the ultimate eco-friendly decorating tool you’ll ever buy. They are always reusable with endless possibilities in creativity. Don’t believe us? Here are some examples. The antlers, reindeer and pine tree stencils would be really cute for a rustic home décor accents like a throw pillow in the family room. And the shining star, marching stars, and Falling Stars would be cute in the back of a kids’ bookcase. 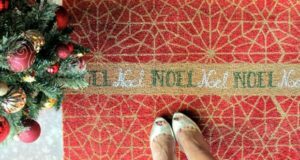 How else can you think to repurpose Christmas these Christmas stencils? Christmas décor doesn’t have to come from a store… Maybe it can mean a little bit more. Want some more Christmas-themed DIY fun? Click here to see what others have done! Spread your Christmas cheer! Share your holiday stencil projects! Email us at projects@royaldesignstudio.com or tag us on Instagram with #royaldesignstudio. Wow, superb blog format! How long have you been running a blog for? you made blogging look easy. The whole glance of your web site is fantastic, let alone the content material!